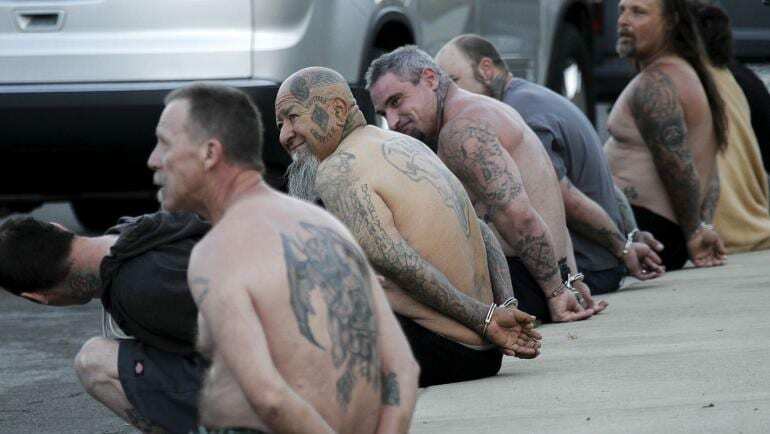 Federal, state, and local law enforcement officers fanned out across three states early Friday morning to arrest 19 alleged members and associates of the Vagos Outlaw Motorcycle Gang charged in a 12-count federal indictment with conspiracy involving racketeering, murder, robbery, kidnapping and aggravated assault, among other charges. The federal indictment, which names 23 defendants including some of the gang’s most senior leaders, is the culmination of a more than six-year probe spearheaded by Los Angeles-based special agents with U.S. Immigration and Customs Enforcement’s (ICE) Homeland Security Investigations (HSI), in close coordination with the Bureau of Alcohol, Tobacco, Firearms, and Explosives (ATF), and the Washoe County District Attorney’s Office in Nevada. During carefully coordinated operations in the Los Angeles area, northern California, Nevada, and Hawaii, investigators arrested 19 of the defendants. Three of those named in the indictment were already in custody on unrelated charges. Investigators determined the final defendant had recently died. The superseding indictment alleges the defendants conspired to participate in the affairs of the Vagos Outlaw Motorcycle Gang, a transnational gang with more than 87 chapters in at least seven countries. The gang has 75 chapters in the U.S., including approximately 54 chapters in Nevada and California. The indictment alleges the gang is highly organized, adhering to a hierarchical chain of command. Its members conspire to enrich the gang, preserve, protect and enhance the power of the gang, and keep victims in fear of the gang through acts and threats of violence. Among other crimes, the indictment charges eight leaders and members, including Ernesto Manuel Gonzalez, aka “Romeo,” with the September 2011 murder of a member of the rival Hells Angels gang at the Nugget Hotel and Casino in Sparks, Nevada. The superseding indictment also alleges the Vagos Outlaw Motorcycle Gang is a closed society whose members value allegiance to the gang and its fellow members above all else, do not fear authority, and exhibit a complete disdain for the rules of society. According to the allegations in the indictment, witnesses to the gang’s criminal acts are typically victims of acts of obstruction, intimidation, and harassment, until they are afraid to approach law enforcement or testify in court proceedings.